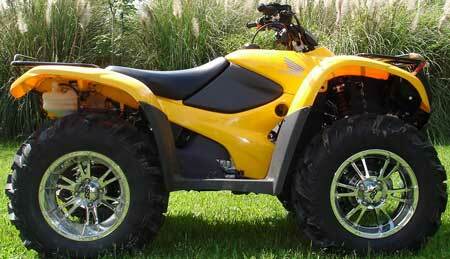 Honda ATV Rims - Best Deals and Recommendations. While it's obvious that new Honda ATV rims make your plain jane Honda 4 wheeler look way cooler - there are a few other reasons for upgrading. That's exactly what we're going to talk about in this article. So grab a cold one and drag up a chair. There isn't really anything wrong with the stock 11" Honda ATV wheels - except for tire selection. Most tires with more aggressive tread patterns only come in the larger 12" and 14" sizes. ATV mud riders in particular will need to look for larger ATV tire and rim combinations. If you want to shop first, just click the links below. Why Go Bigger with Honda ATV Rims? There are several good reasons for switching to larger Honda rims and tires. Improved looks - let's face it - the stock wheels look pretty sad. Better tire choices - the 12" size in particular offers many more choices (and better prices) than the stock 11". 14" not so much, but if you're serious about mud riding, you'll want to take a look. Improved performance - better tires will have better traction which will yield better performance across the board. Most aftermarket wheels are made of aluminum which is considerably lighter than stock steel wheels. That means better acceleration, braking, and handling. More ground clearance - this applies mostly to mud riding and the 14" rim size. The larger diameter of the tire/rim package will give you several inches more ground clearance - which can be critical for making it through deep ruts or over other obstacles. That covers the pros - now let's take a look at the other side. Not to disappointment any of you worry warts - this section is dedicated to you. There's always something to worry about - and we'll tell you what it is here. Clearance problems - larger diameter ATV rim and tire combinations can interfere with suspension and body work and limit steering lock. None of this is fun and can be a real headache to fix. Handling problems - the higher center of gravity caused by installing large diameter wheels and tires can cause your ATV handling to suffer. A greater tendency to tip over in turns and more front end dive when braking can be much harder to control. Cost - Honda ATV rims and tires are a major investment. That's why you want to get the best deal possible. Of course, we have some help for you on that below. Sorry there's not more to be worried about. We have heard some reports of cheaper wheels having some pin hole air leaks. Easily fixed with a little epoxy so it's barely worth mentioning. OK, I think we're done here. Tell Me About the Deals. If you're shopping for Honda ATV wheels, chances are you need tires too. As it so happens - tire/wheel combinations are the best deals! Lately, the best combo deals we've found have been at Ebay Motors. There have been some recent changes at Ebay that have made things more competitive. That means better prices. Good for us! We did the time burning tedious stuff for you and came up with the custom links below so you don't have to. Anything you could possibly want for Honda ATV rims including spacers, bearings, hubs, etc. along with the wheels.